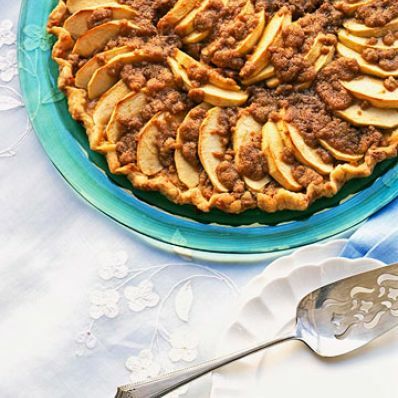 With a cheddar cheese pastry and crisp Granny Smith apples, this tart is sure to impress family and friends. Nondairy creamer imparts a richness to the filling and enhances the crumb topper. 1 of 3 Mix flour and salt in bowl. With pastry blender, cut in shortening until mixture is crumbly. Add cheese. Sprinkle water over flour mixture, tossing with fork, until dough comes together. Do not overmix. Wrap in plastic wrap; refrigerate 1 hour. 2 of 3 Grease nonstick baking sheet. Flatten dough on sheet. Cover with plastic wrap. Roll into 12-inch circle. Remove plastic wrap. Make 1/2-inch-high rim; flute. 3 of 3 Heat oven to 400 degrees F.
1 of 3 Mix creamer, brown sugar, flour, granulated sugar, cinnamon, nutmeg and salt in bowl. Sprinkle half over crust. With pastry blender, cut butter into remaining half of sugar mixture until crumbly. 2 of 3 Arrange apple slices on crust. Mix lemon juice and almond extract; sprinkle over apples. Top with sugar-butter mixture. 3 of 3 Bake in 400 degrees F oven 35 to 40 minutes, until apples are tender. Cool on sheet on rack 15 minutes. Run large spatula under tart to loosen. Slide onto serving dish. Serve warm.